Cozy apartments with living room and kitchen. Bathroom with shower. Each apartment, Villa Marella 1, 2 and 3 is about 24 m2 plus a loft and has a living room with sofa, chairs and table, a small kitchen with ceramic hob, fridge and kettle. Otherwise, equipment for easy cooking. A staircase up on the loft is a double bed. It is possible to insert an extra bed. Those who find their way to us are primarily adults who want to use the place as a starting point for trips around beautiful Crete and spend quiet evenings at the outdoor grill and the pool. There is a wonderful view of the village of Tavronitis, the old historic airport of Maleme, the sea north of Crete and the mountain range Lefka Ori; The White Mountains. There are outdoor furniture at each apartment. The swimming pool is 3 meters from your doorstep. Sunbeds with or without shade. Garden with fruit and olive trees, grapes and flowers. Outdoor grill and a shaded terrace with furniture and lighting. As is known, most airlines are now well paid for checked baggage. And which garment is what usually takes the biggest place in the holiday offer? Well, the bath towel! And it is often the case that only hand luggage is not enough on the holiday season. But now you can come to Villa Marella with only hand luggage! Leave the bath towel and most of the clothes at home, you probably do not use them. Small: A large bath towel for each guest. Price per Guest 20 Kroner. Medium: A large bath towel for each guest, changed after 5 days and a laundry for each apartment after 5 days. Price per guest 60 kronor. Large: A large bath towel for each guest changing after 5 and 10 days, and two clothes sinks for each apartment after 5 and 10 days. Price per guest 80 kronor. Then leave your bath towel at home, pack your hand baggage, and come on holiday to us at Villa Marella you too! "Hand luggage only" can be ordered upon request or as an additional addition to the order form on our website. Toilet, shower cubicle and cupboard with mirror. We have really enjoyed our stay at Villa Marella! 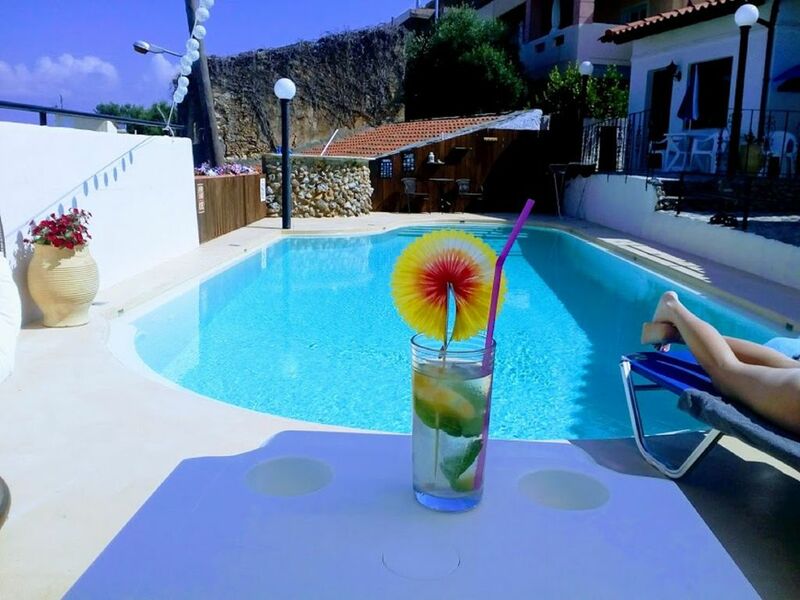 The apartment is clean and nice, the view from the pool is amazing, the location is perfect to visit this part of Crete. Frank has been a very helpful and kind host. Hope to Have the chance to be back again soon! Very quiet and quiet location on a hill above the village of Tavronitis. The surrounding area consists of private homes and some holiday homes. No transit traffic. Panoramic view of Tavronitis, the historic airport of Maleme, the sea and the mountain range Lefka Ori; The White Mountains.